Even when the concrete itself is expertly installed, if left untreated or improperly coated, slab surfaces can begin to deteriorate and exhibit the increasingly severe effects of regular wear and tear over time. If your floor is subjected to conditions like frequent traffic, heavy loads or impact, chemicals, moisture, and other influences, it can begin to degrade—and if left untreated, can produce catastrophic consequences. 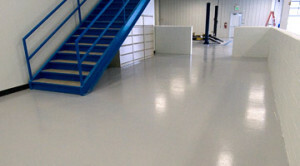 Don’t wait until it’s too late to get the concrete flooring crack repairs you need. Florock’s assortment of high quality floor surface repair systems allows your local approved installer to economically and efficiently fill cracks and divots, improving the integrity of your concrete before proceeding with a new floor application. 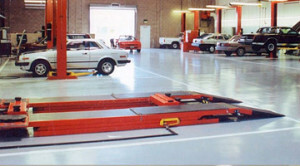 Every facility is different, as are the conditions to which floors are subjected. That’s why Florock makes a variety of concrete flooring crack repair kits—our installers can diagnose the state of your concrete slab surface and recommend the most appropriate solution. There are no universal formulas for superior concrete crack repair. When you work with Florock, you enjoy the peace of mind that comes with getting the best repairs for your specific application. During the installation of a new Florock flooring system, your approved specialty contractor may use some of our floor surface repair kits to patch and fix cracks and breeches in the slab surface. This is part of the concrete preparation process prior to application of your high performance flooring system. For everyday needs, we recommend keeping a few of our concrete flooring crack repair kits on hand. This allows you to fill concrete cracks and holes as soon as you notice them, before they have the chance to expand and become significant—and costly—problems. Then, when the time comes for a new flooring system, the number and severity of imperfections will be minimal, saving you time and money.